Comments: Meets the good condition guidelines. Has writing/highlighting. Has wear. Five star seller - Buy with confidence! Dr. Henry Cloud and Dr. John Townsend are co-directors of the Minirth Meier New Life Clinics West, a group of treatment centers headquartered in Newport Beach, California. As clinical psychologists, they are popular speakers and specialists on such issues as the integration of Scripture and psychology. They also host a daily radio program broadcast throughout the western United States. 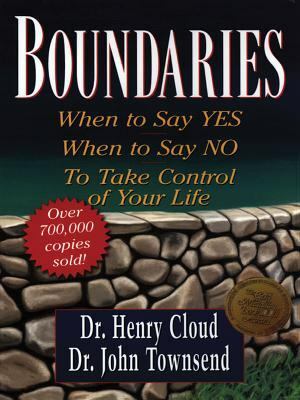 Henry Cloud and John Townsend earned their Ph.D. degrees at Rosemead Graduate School, Biola University.Cloud, Henry is the author of 'Boundaries When to Say Yes, When to Say No, to Take Control of Your Life' with ISBN 9781594150074 and ISBN 1594150079. Loading marketplace prices 165 copies from $8.52 How does the rental process work?